Part 3 of an 11-part review of the 2018 Bears season. Of all the moves Matt Nagy made after being hired as Bears coach, persuading Vic Fangio to stick around as defensive coordinator received the most attention, and deservedly so. Building on the continuity of the previous three seasons with some key personnel additions, the Bears jumped to No. 1 in the league in scoring defense, paving the way for Fangio to be hired as Broncos head coach, fulfilling a career-long goal. 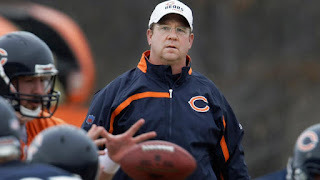 Not to be overlooked is the hire Nagy made for the offensive line, luring Harry Hiestand from Notre Dame for his second stint as Bears offensive line coach. Hiestand is a grinder, happy as can be to lead offensive linemen with no known aspirations of doing anything beyond that. If Patriots offensive line coach Dante Scarnecchia is the best in the business, Hiestand is on a short list behind him, according to Iowa coach Kirk Ferentz, who was a line coach himself in the NFL. Players past and present have enormous affection for Hiestand. Former Bears lineman Roberto Garza, normally concise and to the point, was effusive in his praise of Hiestand last January. The return of Hiestand and improved health on the line put the Bears in a position where they needed only five starting lineups. That’s two fewer than they had in 2017, thanks in large part to left tackle Charles Leno, right tackle Bobby Massie and center Cody Whitehair starting all 16 games. Left guard was practically locked down as rookie second-round pick James Daniels rotated there with Eric Kush for three games before taking over as the starter for the final 10 games. Roll call: Charles Leno (signed through 2021), James Daniels (signed through 2021), Cody Whitehair (signed through 2019), Kyle Long (signed through 2021), Bobby Massie (unrestricted free agent), Bradley Sowell (signed through 2019), Bryan Witzmann (unrestricted free agent), Eric Kush (unrestricted free agent), Rashaad Coward (exclusive-rights free agent). 2019 salary-cap figures: Leno $8.9 million, Daniels $1,579,581, Whitehair $1,344,180, Long $8.5 million, Sowell $1.8 million. 2018 season review: The Bears allowed 33 sacks, tied for eighth-fewest in the NFL. The four teams that played in the conference championship games ranked in the top eight, and seven of the top nine teams in terms of fewest sacks allowed were playoff teams. Protecting the quarterback is the No. 1 order of business for any offense, and the Bears were much improved because of better line play combined with greater awareness by second-year quarterback Mitch Trubisky. The Bears line led the NFL with only three enforced holding penalties, a product of improved play and something players credited to Hiestand. Leno continues to look like a bargain another year removed from the four-year, $37 million extension with $22 million guaranteed that he signed before the 2017 season. He allowed 32 quarterback pressures, according to Pro Football Focus, which tied for 29th-most among tackles, and he was added as an alternate to the NFC Pro Bowl roster Tuesday morning. That makes him the first left tackle since Jim Covert in 1987 to represent the Bears in the all-star game. Leno has been a model of durability with 61 consecutive starts since taking over for Jermon Bushrod in the fourth game of the 2015 season. His streak of 3,957 consecutive snaps ended in the waning moments of the regular-season finale when Nagy pulled him with the playoffs looming. Leno went to the bench for the final eight offensive plays and wasn’t happy. Leno’s run was a very long way from Joe Thomas’ incredible streak of 10,363 consecutive snaps with the Browns, but it’s something Leno took a great deal of pride in and still does. He should. Consider that since 2000, the only other primary starter the Bears have had at left tackle for three consecutive seasons is John Tait from 2005 through 2007. After Leno’s streak of 61 consecutive starts, the longest streak the Bears have had at left tackle since 2000 is 32 by J’Marcus Webb from 2011 to 2012. Leno has taken the job and run with it, and he should continue to improve under Hiestand. The Bears wanted to make sure Daniels, who was 20 when the season started, was ready for a starting role before they plugged him in. They wanted him to earn the promotion on the practice field, not because of his status as the 39th pick. He did that and was able to push Kush, who was dealing with lingering effects from a stinger, to a reserve role. The job wasn’t too big for Daniels, who has good size for the interior and easily made the transition to guard after spending most of his college career at center. He didn’t allow a sack, according to STATS. Whitehair improved after an up-and-down 2017 season, thanks in large part to having a set position, and that work did not go unnoticed as he was also added to the Pro Bowl as a replacement. The Bears moved him back and forth in 2017, starting him at all three interior spots as injuries created havoc for the previous coaching staff. He struggled over the summer and in the preseason with shotgun snaps. Instead of being stubborn, he embraced a new technique, using what is called a “dead snap” instead of the more traditional spiral. It wasn’t perfect, but he quickly smoothed out his snapping issues. Although Long was slowed during the spring and brought along slowly during training camp after three offseason surgeries, he was in place for the start of the season and added brawn and power to the right side of the line. He suffered a tendon injury in his right foot in Week 8 against the Jets, forcing him to injured reserve, but he set a goal to be back before the season ended and achieved that, a testament to the hard work he puts in after injuries. Long probably was on the ground too much at times, but he was clearly better than fill-in Witzmann. Massie just finished the final season of his three-year, $18 million deal, which is quietly one of the best free-agent contracts general manager Ryan Pace has issued. After a bumpy first two months with the Bears, he has been solid at right tackle, and the 29-year-old enjoyed his best season as a pro. Massie was charged with only two sacks allowed by STATS and 25 pass pressures, per Pro Football Focus, tied for 47th-most among tackles. Witzmann was signed in October, and his knowledge of the offense from his time in Kansas City made his insertion into the lineup an easy adjustment. He’s a capable backup, which could make him a smart re-signing. Sowell wasn’t needed much as the swing tackle, but the Bears are comfortable with him in the scheme. Free agency/draft priority: There is work to do here, and Pace knows the best teams are proactive when it comes to the offensive line. It’s too easy to get stuck in a bad position if you’re not regularly adding young players with upside. The Bears had a major decision to make involving an $8 million option for guard Josh Sitton a year ago, and they elected to decline it. They have to decide if they want to pursue Massie in free agency or seek another experienced option because the chance of finding a starter with a third-round draft pick, at least a plug-and-play Day 1 starter, seems remote. Massie’s potential return will be a money-driven decision. Are they comfortable investing in him for a couple of more years? Coward is a developmental player who shifted from the defensive line to the offensive line a year ago, and it might be a year too soon to think about him as a possibility at right tackle. The only real action he has had came in the preseason as he was inactive for all 16 regular-season games. The Bears will need to re-sign Witzmann or another depth-type player. Bottom line: The Bears improved on the offensive line and there’s reason to believe they’ll be even better in 2019. One looming question is whether the team will consider flip-flopping Daniels and Whitehair. Nagy believes continuity is necessary for the center-quarterback exchange, which is one reason the team wouldn’t make that switch during the season. Would they consider a move at the start of the offseason, especially with Whitehair coming off a season in which he was added to the Pro Bowl? Whitehair is eligible for a new contract and he switched representation during the season, surely with the idea of working toward a new deal. Leno and Whitehair have emerged as leaders on the line since Sitton left, so extending Whitehair figures to be on the to-do list, maybe come training camp. Long’s durability has been an issue, but he has shown his toughness in battling back. Given the shortage of draft picks and less cap space to work with, it seems unlikely the Bears will create another need by letting him go. The best thing Long has going for him right now is that he enters the offseason not needing surgery, so he can focus on getting stronger. The right ankle injury suffered in 2016 remains the biggest issue for him, but figure on the Bears counting on him again in 2019.